Watch this TED x talk. It is inspiring. It is moving. It is important. Watch it and share it. Not just because it's about bikes but because it is about caring for our elderly, rebuilding a volunteer-minded society and it is about how individuals with passion and vision can change things. Change things quickly, effectively and massively. I know this individual. I work three metres from him every day. Ole Kassow is his name. I met Ole in 2010 at TED x Copenhagen when I was presenting this TED talk. He introduced himself and told me that reading Copenhagenize.com and Cycle Chic was the direct inspiration for selling the family car and banking on bicycles, as I wrote about previously. Ole is the single most inspiring individual I know in my life. Full stop. The story, outlined in the above TED talk could have happened to many people, but of course it happened to Ole. 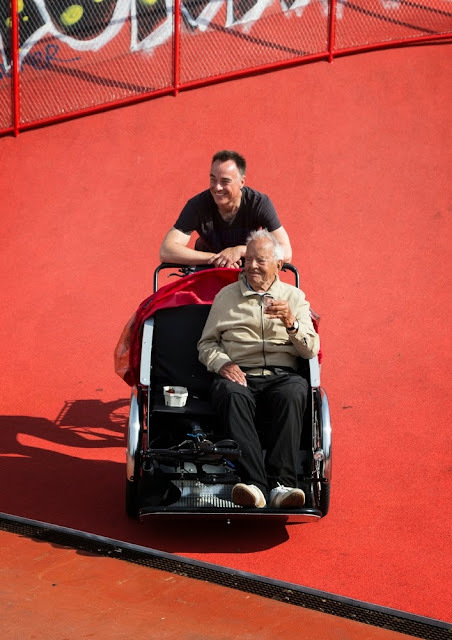 And of course Ole took it to the next level, even though the development of the project Cycling Without Age / Cykling uden alder has taken him by surprise. There are countless good points in the book The Culture of Fear by British sociologist Frank Furedi about the societal development since the 1950s - from a sense of community to a more egoistic, individual state of mind. This loss of community is regrettable. Fewer people volunteer for things, fewer people participate in organisations, etc.. It's easier to LIKE something on Facebook. I don't need to write too much about Ole's Cycling Without Age project - he spells it out brilliantly in the TED talk, above. But I am amazed how the project has captured the imagination of so many people and how the volunteer-based participation bucks the societal trend in style. People of all ages are signing up to take the elderly for bike rides. Giving the elderly The Right to Wind in Their Hair with bicycles is something that has hit a nerve. As I write this, there are about 37 municipalities in Denmark who are now rolling around with their elderly citizens. 150 rickshaws are on the cycle tracks of the nation, with many, many more on the way. Because of the demand, Ole is having a new rickshaw developed. The international interest is just as massive. Eight municipalities in Norway are rolling. There is interest from twelve countries in starting up Cycling Without Age. Even as far away as Australia, New Zealand, US and Canada. You can never plan for anything to go viral. It just does. When it's a passionate project about caring for our elderly, it's fantastic. Cycling Without Age in Your City? I have been completely fascinated by the European Space Agency landing a probe on a comet 500 million km away from earth this week. I've been staring at the photos, absorbing all the articles. It's amazing. If I think about it, however, Cycling Without Age led by Ole and his team is just as impressive. The same "how is it POSSIBLE?" and "how do they DO it?" questions arise. I am amazed, inspired, impressed. Let's not rest until rickshaws are rolling around the world and our elderly have been given the right to wind in their hair.